CNN has decided to dream up a “what-if” scenario – a catastrophic attack on Friday’s inauguration festivities that could leave the Barack Obama Administration in charge. It’s almost like they were fantasizing on how to keep Donald Trump from assuming the mantle of the presidency. In the farcical scenario, broadcast by Wolf Blitzer in his Situation Room, it was touted as “Breaking News” with a “Developing Now” graphic below. What was actually developing was fictional nonsense. From there, CNN reporter Brian Todd explored the line of succession if there was a terrorist attack at the festivities. Even after the official transfer of power at noon, he claimed, the Obama Administration would still remain in power. How? If Obama and Biden, Trump and Pence were killed, along with the Speaker of the House and the President pro-tem of the Senate, the next in succession would be the Secretary of State. Since Trump’s choice for that post – Rex Tillerson – hasn’t been confirmed yet, that would fall to John Kerry. But – the idiotic “news” report tells us, Kerry, and of Obama’s other cabinet posts will resign at noon. So what happens then? Well, Todd breathlessly tells us, that responsibility falls to the highest “non-political” position in the State Department. 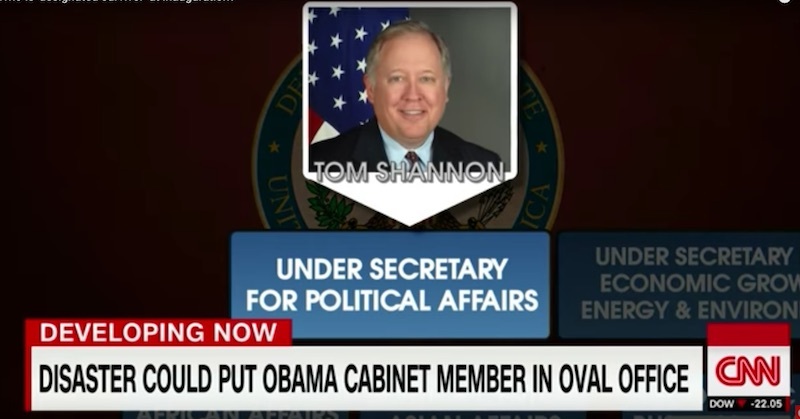 Right now, that’s Undersecretary for Political Affairs Tom Shannon. So even after Trump is inaugurated, CNN tells us, there’s still a glimmer of hope that Obama – even if he’s killed – can still control the White House. So – as Breitbart points out – while the rest of the world will be enjoying the day’s events and waiting expectantly to hear what our new president will have to say for the first time as leader of the free world, CNN will be daydreaming what would happen if Trump – and everyone else – is assassinated.